If you've already had even the the slightest experience of Gaelic culture- dance, language, music, history and traditions, it's almost impossible to resist not wanting more. The appeal is global. You can find people playing Irish football in Hong Kong, ceili and set dancing in Boston, and learning Irish Gaelic in Paris. The culture is both fascinating and fun. Many parts of it are strong and thriving both at home and abroad. However, the native language in both Ireland and Scotland is threatened primarily by the spread of English around the globe. This site hopes to celebrate and inform on all aspects of the culture-both strong and weak. While I go into the complexities on our Celtic language page, you can think of the Gaelic culture as a subset of the broader Celtic culture. The focus here will be on matters in relation to Irish culture but we will also take a look at Scottish culture too. Which aspects of the Gaelic culture and Gaelic Language can you expect to be covered here? 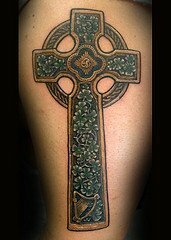 The Shamrock, Sheela na Gigs, the Celtic Cross, the Celtic Knot, the Claddagh Ring and the Round Towers of Ireland are national symbols. Find out about their origin and visit the related galleries. The Mystery behind the Banshee of Ireland. Learn about one of the most fascinating creatures or spirits of Irish folklore. Looking for Famous Irish songs Lyrics? Gaelic culture is full of many wonderful traditional Irish songs. Listen to some great versions and find free and famous Irish songs lyrics in Gaelic and English here. What are the Traditional Sports of Ireland? Discover the traditional sports of hurling and gaelic football and enjoy the excitement of these games. Find out what Irish Times readers consider what being Irish means. Funny, inciteful and not alway flattering quotes but well worth a read. A modern view. Where and when are the best Irish Festivals? Where are the best Irish festivals around the world?. Find out what our visitors say and let us know if you have discovered a Celtic gem which celebrates the language and culture. There are Gaelic sayings about every aspect of life and love and for every occasion. I have put together the wise, unusual and funny ones for weddings, birthdays etc. I have put together a collection of Irish love poems, many of which are beautifully translated from Gaelic and there's a special Irish wedding poem page. Find out about Irish wedding customs and traditions, an interesting part of Gaelic culture, and visit our Irish wedding superstitions page for some far-fetched beliefs. St Patrick's Day comes around the 17th March every year. Prepare to celebrate with some St Patrick's Day poems and songs. 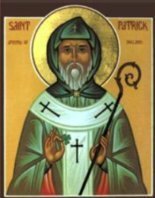 You can also learn about History of St Patrick. There are also traditional Irish blessings for every situation and here you are sure to find one to meet your needs. Like blessings and sayings, there are Irish toasts for every moment. The Irish have a reputation for liking to drink but their enjoyment and celebration of good company is even greater. The Irish love of words, whether in native Gaelic or adopted English, is all about fun. You'll love this collection of funny Irish quotes with special pages from some masters such as Oscar Wilde, Flann O' Brien, George Bernard Shaw, Brendan Behan and Spike Milligan. The Irish way with words also extends to curses and the creativity and quirkiness behind these examples of wishing bad on someone is hard to beat. An integral part of Gaelic culture but not for the faint hearted! Did you know that Scotland is the home of Golf? The history of golf begins many centuries ago. Find out about its origin and learn some interesting golf history trivia. The Irish Gaelic language is a Celtic Language. Get your head around some of the common misunderstandings about it. Want to learn Gaelic? Here are some basic Irish words, Gaelic phrases and expressions to get started. Need advice on getting an Irish Translation or finding an accredited Irish Translator? English to Irish translation advice and suggestions, with over 100 accredited Irish translator contact details. Both Irish and Scottish Gaelic have 18 letters. While modernisation has taken place, the decorative Gaelic font is still used at times in Ireland. Take a look. As I have mentioned above, many parts of Gaelic culture are increasingly popular worldwide. However, the Irish Gaelic language is in trouble but refuses to die. There has been a Gaelic Revival movement for the last 150 years which has met with mixed success. Is there a Celtic Language? In fact there are six and I have provided a good introduction to each. You can also listen to what each sound like here. There's a lot of interest in but little understanding of what the ancient Celts believed in. Find out about religious practice before the arrival of Christianity in Ireland. Unravel some of the mystery of those ancient Celtic priests, the Druids. Whiskey, from the Gaelic words 'uisce beatha' meaning 'water of life' has been made in Ireland for centuries. Discover the wonderful Greenspot Irish whiskey or gems such as Paddy Irish Whiskey, a great everyday whiskey. For many Irish people the only Irish Gaelic they remember is in the prayers they learnt as children. I have put together a good list of common prayers here.